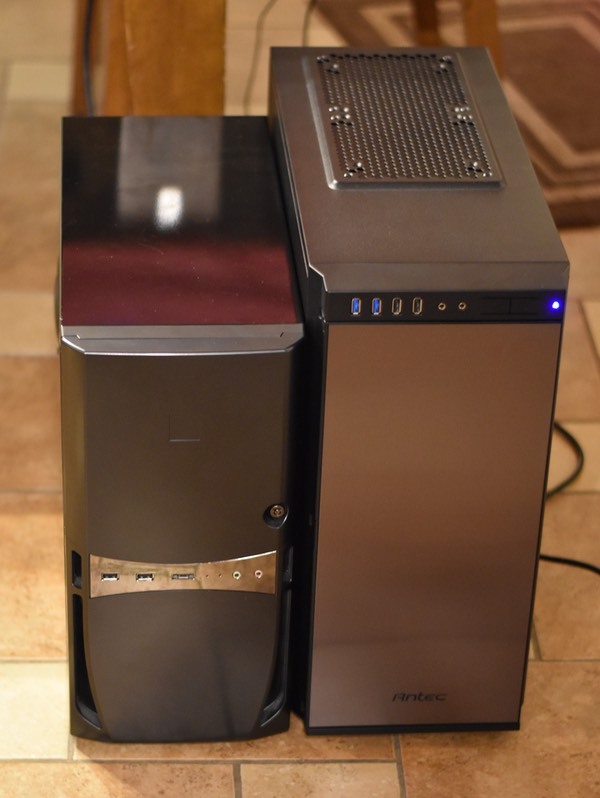 My old case was an Antec Sonata III 500, and I found it to be relatively easy to work in and quiet. So I chose to stick with Antec for the new case, and went with the P100 (Antec product page | Amazon). This new case is somewhat larger than the old—2.3 inches taller, 2.4 inches deeper, and .6 inches wider. I mostly care about the width, as it needs to fit in a space under my desk (it will). As seen at right, the case is visibly larger than the old one, but it’s still not a full tower case (which would be another two to three inches larger in all dimensions). 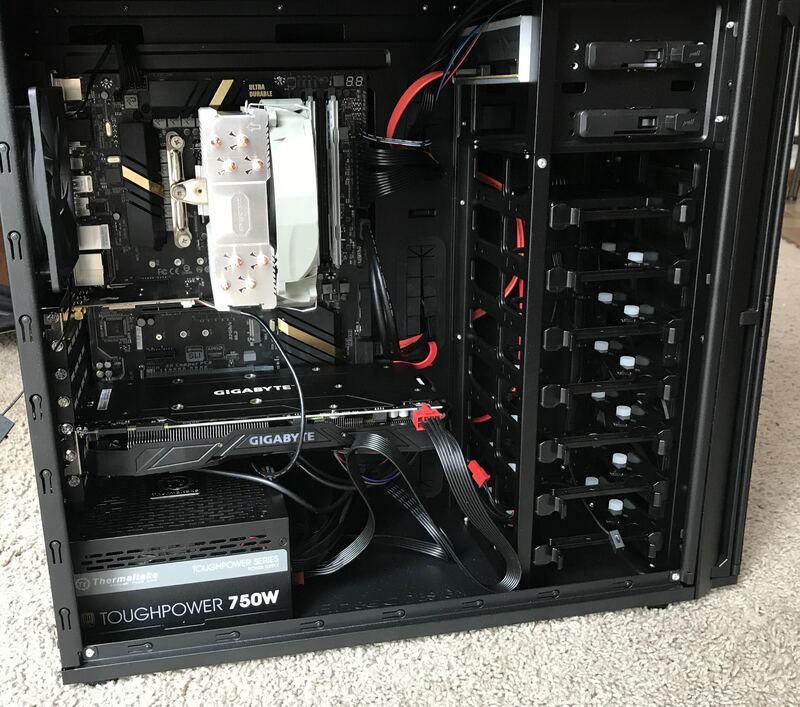 This case was relatively inexpensive ($75), but for that price, I’m impressed with both the build quality and the features, which include noise-blocking foam on the steel panels, two removable air filters for the front fan and power supply, behind-the-motherboard cable routing, and well-labeled front motherboard connectors. 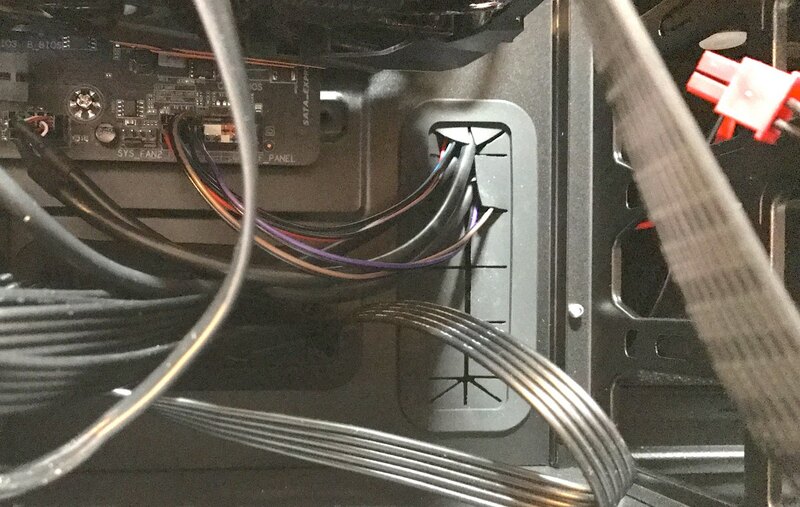 There are other nice touches: The seven internal bays have grommets to silence 3.5″ mechanical drives, and can handle 2.5″ or 3.5″ drives. The corners of the case are rounded, so you won’t lose skin due to an accidental scrape. The sides come off and on very easily. 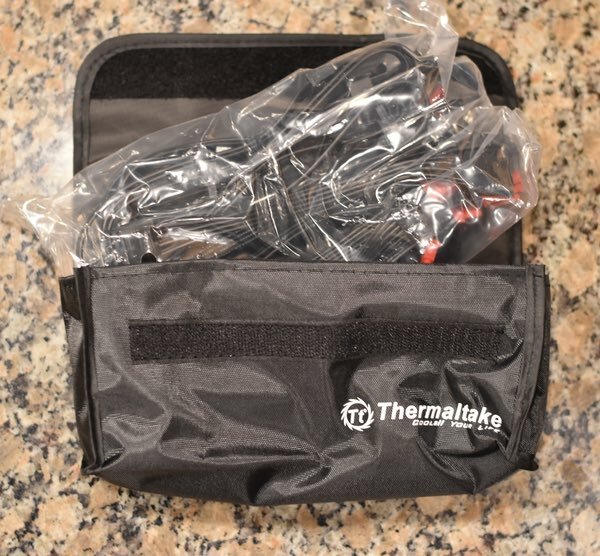 The case didn’t come with a printed manual, but there is one available online. And I needed it, just to understand some of the cable routing options and fan connections. It took me a while to get everything set up, but once it was all plugged in, Frankenmac booted on the first try—and my GTX 1080 card works! Tomorrow, back to the story of getting from the BIOS screen to full Frankenmac status. Is that a warming spot for the cat on top of the new case?